In the absence of such collaboration, it will be impossible to achieve the type of technical, behavioural and political changes that are needed to improve water governance at global and national levels, as well as in water management and local use. 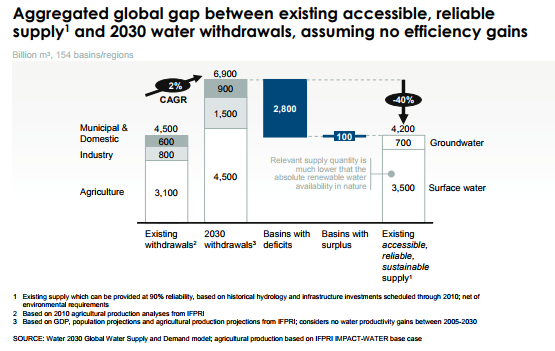 The 2030 Water Resources Group (2030 WRG) demonstrates what is possible. 1. Government in the lead: The multistakeholder approach offers an alternative to what has primarily been a public sector role when ultimate responsibility still rests with government. A core priority of the approach is to help address the capacity gaps and overcome the political constraints that many governments face in managing water resources effectively and transparently. 2. Local ownership and collaboration from business and civil society: Greater inclusion and decision-making by local business and civic leaders have been essential in identifying shared priorities, designing feasible solutions and creating the incentives and buy-in needed for implementation. How do we prevent today's water crisis becoming tomorrow's catastrophe? 3. A combined focus on data and analysis, stakeholder dynamics and the political economy of change: The 2030 WRG has learned the importance of balancing rigorous data and a technical understanding of water challenges with an appreciation of the institutional and political context. In addition to highlighting water security as a potential constraint on economic growth, it considers social and environmental concerns to generate a sense of shared urgency among diverse stakeholder interests. 4. Strong ‘backbone support’: A challenge of many multistakeholder platforms is that they unite parties who are at best unfamiliar and at worst distrustful of each other. Backbone support from a team that has the ability to stimulate, coordinate and support collaboration among such parties is essential. It requires a combination of technical expertise alongside the ability to think long-term, live with uncertainty, and learn and adapt along the way. 5. Vital roles for individual champions: Individual leaders have been essential to the evolution of the 2030 WRG. They have ranged from government ministers to corporate CEOs and practitioners from the participating organizations. Many have taken real, personal risk, investing their time, effort, influence, networks and, in some cases, reputation as vocal supporters for a collective effort they do not control and the outcomes of which are uncertain.